Beautiful quilts are meant to be shared, not just stored but this quilt case also called a quilt curio display case is a way to keep them safe and secure. 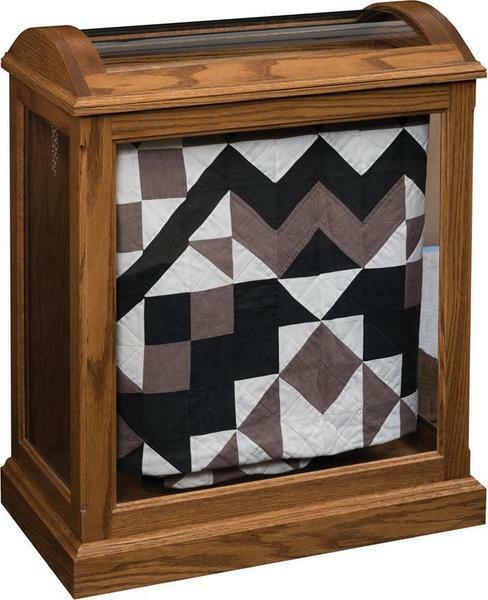 Place your family heirloom or otherwise prized textile on display with our Medium Quilt Curio with Enclosed Base. This curio cabinet does double duty: protecting treasured handiwork while allowing it to be displayed and appreciated through approximately 4 square feet of glass. You can also rest assured this curio cabinet is built to last -- choose from more than 10 woods, including beautiful rustic options that complement the timelessness embodied by handmade quilts. Custom curio cabinets and quilt display cases are available. Please call one of our Amish furniture specialists with questions, to place an order or for custom Amish furniture. We offer a wide variety of quilt display cases and quilt racks at DutchCrafters.